Shortly called Sonic Soak, the device is a portable cleaner that’s here to replace your washing machine, revolutionize how you clean things in your home, office, or anywhere at all and cater for all your cleaning needs. 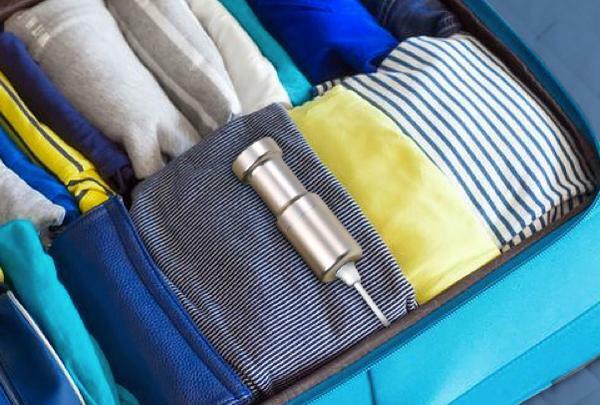 Dubbed the “world’s smallest washing machine”, the Sonic Soak is only about 5-inches long, weighs less than 4 ounces, and can literally fit in your pocket. Some even call it a “pocket washing machine”. The Sonic Soak is a cleaning tool or device that uses ultrasound to get rid of stains, dirt, grease and almost anything from clothes, food, fruits, vegetables, accessories, dishes, cutleries etc. For a device to clean these many things (and more), its definitely exciting to try it out, or at least see what it can do and how it achieves them. Read on to find out. Sonic Soak was a product of a crowdfunding product. The company that manufactured the ultrasonic cleaner was able to successfully raise more than US$ 2 million on Indiegogo and subsequently used the funds to produce one of the best, most portable, and most innovative cleaning tool in the world. But what exactly is the technology behind the ultrasound mechanism which Sonic Soak uses to effectively clean materials and food? As mentioned earlier, Sonic Soak uses ultrasonic technology in its cleaning process. And while ultrasonic tech has previous applications in medical and industrial fields, Sonic is bringing it into our homes and everyday activity. 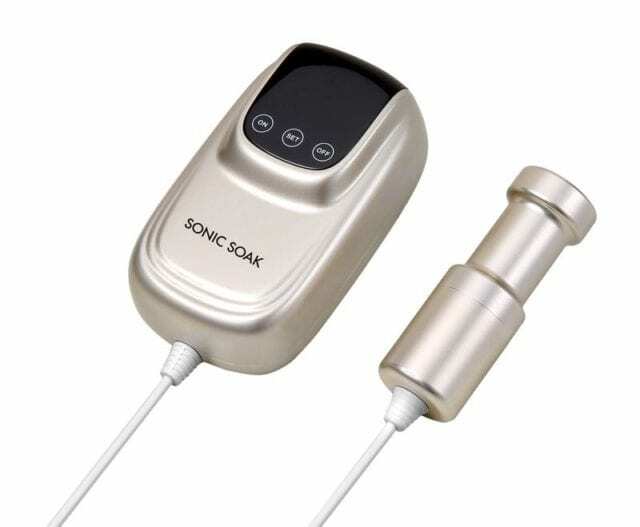 Under the high-quality medical-grade stainless steel exterior of the Sonic Soak are a couple of material that produces an oscillating sound pressure wave that operates at a frequency beyond the human hearing. The manufacturer boasts of the effectiveness of this ultrasound technique as it has carried out numerous successful lab tests of clothes, accessories and a couple of other materials. When placed in water during usage, the modulated ultrasonic waves that the Sonic Soak produces travel through it (water) and cleanses the subject material at microscopic level, eliminating not only dirt and stains but also bacteria and harmful chemicals in the process. We’ve harnessed this [ultrasonic] technology and compacted it into this sleek package using a stainless steel exterior to ensure that the Sonic Soak does what it promises. To prove that the ultrasonic sound waves produced by the portable machine is powerful enough to pass through fabrics and as well remove stains from other materials, Sonic instructs users to perform a pre-test on the cleaning tool by wrapping an aluminum foil around the device when newly unboxed and get it running. The ultrasonic waves from the device will perforate the aluminum foil, serving as an indication that the Sonic Soak is in good shape and will clean your cloth effectively. How does the Sonic Soak work? The Sonic Soak ultrasonic cleaner is super easy to use. All you basically need is the cleaner itself, a power source, water, and a container, bowl, bucket, plastic bag, kitchen sink or anything to safely hold the water and material to be cleaned. Got everything in place? Then proceed to fill the container with water. Plug in the device into the power source. Dump your dirty items and the Sonic Soak cleaner into the water. Set the timer (preferred cleaning duration) and start the device. Once the cleaning process is completed and you are satisfied with the result, remove the items, rinse, and dry. Otherwise, you can rewash until the material is cleaned to your satisfaction. During the cleaning process, the Sonic Soak cleaner makes 50,000 vibrations per second to ensure deep cleansing. And despite this vibrations, the operation is ultra quiet. It’s also gentler than washing with hands, eco-friendly, and uses 15 times less energy than standard washing machines. Though the Sonic Soak device is commonly used on laundry and delicate fabrics, it has also been tested on food and vegetables, kitchenware, jewelry, watches, toothbrush, sunglasses, makeup kits etc. You can equally connect the device to your smartphone via an app to remotely control cleaning schedule and duration. The Sonic Soak is a very versatile device and its use case is numerous. At only 4.5-inches, the Sonic Soak is not a full-fledged replacement to your home washing machine. 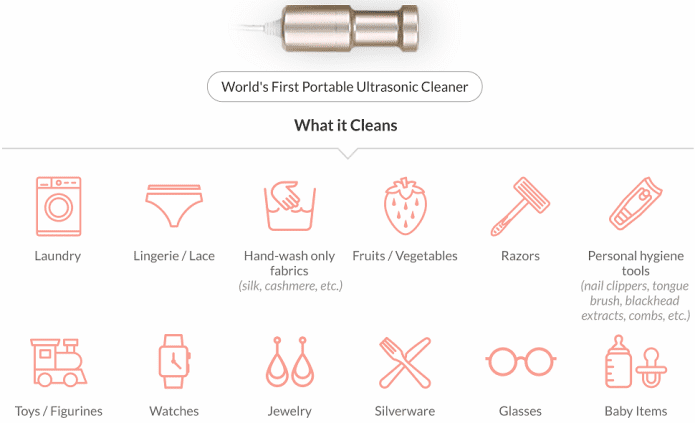 Rather, a portable and lightweight on-the-go cleaning solution perfect for travelers. The fact that it can be used anywhere with little water is another advantage. Home users who intend to do “light cleaning” of fruits, vegetables, food, accessories, and other stuff can also cop a unit of the Sonic Soak. For items with deep stains, the device might not totally rid the materials of deep stains but only fade them out to an extent. Usage is also pretty straightforward and the device is easy to control; either using the 3 buttons below the display or remotely via phones and tablets. The Sonic Soak Ultrasonic Cleaner is available for purchase at a retail price of US$150.